If you ring the surgery on 01752 662780 outside of normal opening hours and your problem cannot wait until the surgery re-opens, you will hear a recorded message advising you to ring NHS 111. 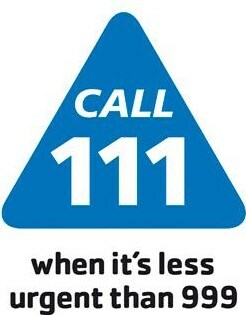 NHS 111 You should use the NHS 111 service if you urgently need medical help or advice but it’s not a life-threatening situation. 111 will give you the healthcare advice you need or direct you to the appropriate local service – for example, Devon Doctors, minor injuries unit, emergency department, community nurse or pharmacy. Note – calls to and from these services may be recorded. The nearest Casualty department is at Derriford Hospital. There is also a minor accident unit at the Cumberland Centre in Devonport, Plymouth. Phone on 0845 1558003. The Royal Eye Infirmary, based at Derriford Hospital, offers accident and emergency advice for eye-related conditions. Phone on 01752 439330 (9.00 am to 6.45 pm). In a genuine emergency you should call 999. Chest pains, collapse or acute shortness of breath constitute an emergency.